GitHub - Dviros/CredsLeaker: Credsleaker allows an attacker to craft a highly convincing credentials prompt using Windows Security, validate it against the DC and in turn leak it via an HTTP request. 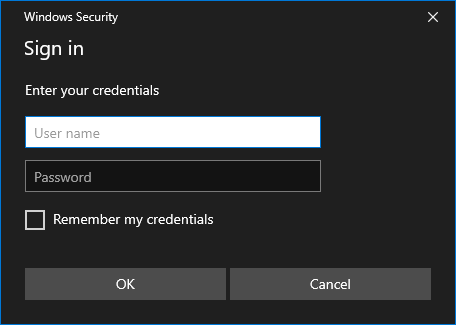 Credsleaker allows an attacker to craft a highly convincing credentials prompt using Windows Security, validate it against the DC and in turn leak it via an HTTP request. Want to be notified of new releases in Dviros/CredsLeaker? This script used to display a powershell credentials box asked the user for credentials. However, That was highly noticeable. Now it's time to utilize Windows Security popup! Tested on Windows 10 (1809) with Powershell version 5.1. Needs to be tested on 7\8\8.1\ Servers and different powershell versions. Can be modified (title, message etc.). Added WORKGROUP support (validation is done against the local SAM). As before, The box cannot be closed (only by killing the process) and will keep on checking the credentials against the DC. When validated, it will close and leak it to a web server outside.